It was a freezing, cold, windy night when 68’s Winter Tour with Whores came through Indianapolis’ Hoosier Dome but things couldn’t have been hotter inside when one of the most intense shows ever to come through the Dome started up. After a scorching set from local band You’re Letting The Light In, Alistair Hennessey took the stage and completely blew the crowd away. It was an interesting set to say the least; instead of using the stage lighting, they used normal lights from their amps accompanied by four table lamps which lined the front of the stage, synced up with the venue’s electronics, making for a very cool, unique experience that screamed originality. Whores. took over not long after and this is when things really picked up. After having some serious technical difficulties with the sound- major feedback through the monitors and some of the monitors not being completely secured- Whores. took the energy in the room and maximized it. 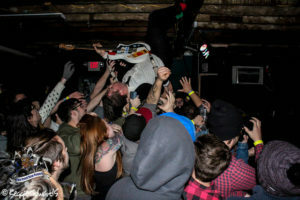 You could tell frontman/guitarist Christian Lembach, bassist Casey Maxwell and drummer Donnie Adkinson were beyond frustrated but the show must go on- “I hope you guys like noise!,” exclaimed Lembach, who was wearing a brace on his leg. Lembach explained during the set that, earlier this year when they were in the middle of a tour in Canada, he tweaked his knee but didn’t think much of it until they played some festivals and the trek was done and his knee was still bothering him. 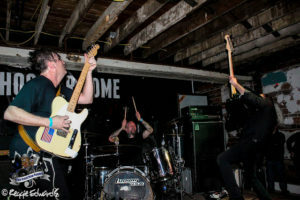 He went to a doctor to have it looked at, who told him they would be getting to know each other pretty well and, long story short, he had multiple surgeries and here he was; It’s hard to think of anyone giving 68 frontman Josh Scogin a tough set to follow but that’s exactly what Whores. did. Dawning suits and ties, Scogin and drummer Nikko Yamada took the challenge and blew everyone out of the water within minutes of their set starting. The small venue room was filled almost to capacity and it was very hard to move and walk around, making it for an immediately fun atmosphere. Sometimes the crowd can make or break a show and this time they made it on so many levels. 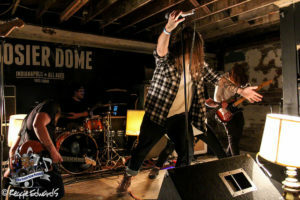 With Hoosier Dome being one of the few legitimate all-ages venues left in Indianapolis, the fans in attendance took things as far as they could. Not only were they circle pitting but running on stage and stage diving as well. 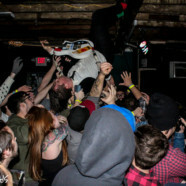 As he always has, Scogin fed off the energy of the crowd, stage diving as well and letting the fans hold him upside down and try to hang his legs from the rafters; He also threw the mic stand into the crowd at one point so they could surf the stand. 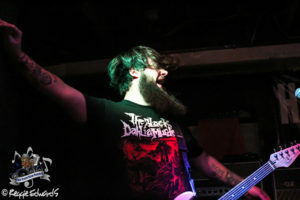 Scogin’s voice was very rough to begin with, as the explained to the fans that his voice was “completely shot.” The fans didn’t care and it really didn’t show, as he was hitting every note and it didn’t take away from the show at all. Scogin even took time at the end of the show to joke about it, saying “If it sounds like I’m not hitting every note, I promise I’m a professional. Please get your hearing checked,” which was met with a roar of laughter from the fans, who sang along to every word of every song so loud, it was as if they were on stage as well. The show ended with Yamada knocking over his drumset and Scogin knocking down the guitar cases and amp stacks, standing on top of them and playing triumphantly as only 68 can.